Tag Archives: Rev. Dr. MLK Jr. The maniacal march of economic inequality, from which springs the source of racism, poverty, crime, violence, and lack of access to health care and higher education, has become the new civil rights issue of the 21st century. Rev. Dr. King’s dream of unconditional equality throughout the country can finish becoming a reality when the economic barriers that we all face on a daily basis finally come down for good, like an economic Berlin Wall. Rev. Dr. Martin Luther King, Jr. spoke to the masses during the 1963 civil rights march on Washington and said, “I have a dream…”. By writing and publishing these words it is my intent to help take up where Rev. Dr. King’s Dream left off, and to do anything I can to help finish the job that he started. And so let me slightly change that to, “I dare to dream”. I dare to dream of a world in which the widening gap between rich and poor is gone forever. We all deserve to live in a world where wealth has been redistributed in a peaceful and orderly manner and not by the barrel of a gun. I dare to dream of a country where wealth has been redistributed in 4 ways. First, every worker earns a living wage so poverty can be eliminated. Second, free higher education and vocational retraining must be available to every worker for life, including daycare when necessary, because everyone has the right to better themselves at will. Third, I envision an America where quality health care is available to every worker at nominal cost for life. Single-payer health care based on the current Medicare model must not be reserved only for certain people, but it must be a fundamental human right for all ages. I dare to dream of an America where there will be no such thing as someone without health insurance, where every citizen will have lifetime health care and prescription drug coverage without qualification, and where there will be the fewest sick days for American workers and their children of any country in the developed world. Fourth, “we the people” demand the abolition of the federal tax code, including elimination of the despised federal withholding tax, which would give every American worker or business owner an immediate 18% net pay raise. I dare to dream of a new America with a robust and viable economy. That is why I have been insisting on a $15.00 per hour minimum wage since 2010 (earlier versions of my book were $10.00 and $14.00 per hour respectively). I dare to dream of a new America where education will be subsidized from the cradle to the grave so that the US develops the most formidable work force the world has ever seen. I dare to dream of an America where all workers have the right to organize, to a flexible work week and to paid family or maternity leave. Most other developed countries already do this. The US is the only exception and that has got to change. The only remaining question in my mind is whether we can accomplish this peacefully or otherwise, and it is looking more and more to me like it could be the latter, and that concerns me a great deal. I dare to dream of a country with new public works programs that put an end to unemployment forever so the USA can have full employment all the time. America’s infrastructure needs to be rebuilt, and its inner cities are in dire need of an overhaul. What a better way to accomplish this! People by and large don’t want a handout, they want to earn a decent living! I dare to dream of a new America with an all-new public school and university system that has an Internet-based curriculum that can be updated at will, and that is second to none in the developed world, with a new and more intensive school year, and that has viable replacements for standardized testing, and where class size is limited by law. I dare to dream of a country where teachers, police officers and firefighters make what their Congressional representatives make, and vice versa. I dare to dream of a new nation where unconditional equality is the law of the land for every citizen without exception, and this will include economic equality. I dare to dream of a new America where there is no more income tax, no capital gains tax, no alternative minimum tax, no estate tax, no self-employment tax, and where families and businesses can have a tax free income unless they are very wealthy. In its place would be a national sales tax, such as a Consumption Tax, where everyone pays proportionately the same tax rate on only what they consume, plus an “excess wealth tax” for persons with annual incomes exceeding $3 million, and for businesses with annual proceeds exceeding $700 million, so America’s budget can be balanced and fair. I dare to dream of an all-new voting system – including the abolition of the elitist Electoral College – that is Internet-based, paperless, and that can be accessed from any location using any computer or wireless device, instead of wasting our time and fuel and losing work time going to polling stations, and instead of using poorly secured and easily- tampered-with voting machines. I dare to dream of an America of integrity where all of the dirty special interest money and all the filthy lucre is abolished from our political process. I dare to dream of an America where the Wall Street shysters who crashed the US economy are finally brought to justice, and where the keys and title deeds to all of the fraudulently foreclosed homes are returned to their rightful owners. I dare to dream of the end to America’s sinister war on drugs, where all convicted nonviolent drug offenders can qualify for alternative sentences for their offenses so they may obtain early release, and where all natural (i.e. cannabis, mushrooms, peyote, etc.) drugs are legalized, regulated and taxed by appropriate legislation for medical and recreational use. Finally, I dare to dream of a world in which all this is financially easily achievable. That’s because all the money currently being wasted on the wars in Iraq, Afghanistan, Yemen, and to a lesser extent in Pakistan, Libya and elsewhere will be redirected towards all these dreams that I have just mentioned. The money is already there, its just being budgeted in all the wrong places. Let me tell you why. If the US military took all the money it spent occupying Afghanistan for just one day and put it into an interest-bearing account, there would be enough money available to send every American school kid from the first grade up to high school seniors through 4 years of college fully paid for, including tuition, dorms, books, food, access to the Internet and to public transportation. Here’s another example: If the US government took all that money set aside from one days worth of military expenditures in just Afghanistan alone, there would be enough money to build a 2,500 square feet house, fully furnished and stocked with a year’s worth of groceries, with all the utilities already turned on, for every homeless person in the US, beginning with all the kids. That’s how easily we can end homelessness in the richest country in the world. Since the political will to do these things currently isn’t there, and since it never will be so long as we wait on the government to fix all this stuff, it is up to “we the people” to do the job ourselves. Just as surely as there was an Arab Spring beginning in 2011 that is still ongoing, so I am telling you that there will be an American Spring in 2015. 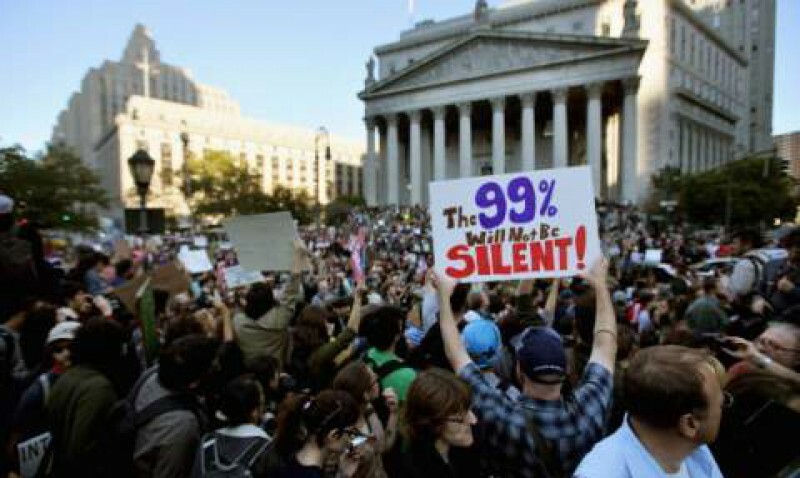 Beginning in 2011 with the start-up of the “Occupy” and “99%” Movements, of which I am proud to be a part, this uprising of the American people against the top 1% has exploded like an atomic mushroom cloud over the American political and economic elite. Once this process is complete, the American people will take back what has been stolen from them without anyone having fired a single shot. Let the remaining 99% of us try first to peacefully take back what has been stolen from us over the last 100 years. But if peaceful revolution is stifled we will be left with no choice but to resort to force. We can only accomplish this by uniting together as one and acting as one body to break free from the shackles of oppression that have us all enslaved. You have just read the last four pages of chapter 9 of my book, “The Middle and Working Class Manifesto” (3rd edition, Copyright 2011, 2016 by Rev. Paul J. Bern, Progressive Christian Ministries of Greater Atlanta, Inc., 470 pages, $18.95 on Amazon, or get the E-book on Pay-hip at https://payhip.com/b/CV5h [also on Kindle or Nook] for $3.50) To order your copy, go to http://www.pcmatl.org/books-and-donations. I also have a few leftover 1st editions in softback for $9.95 with free shipping, but quantities are very limited. Thanks so much! Shalom.